"You know, Bruce, it seems all these towns are the same. They are all fishing villages, raided by the Vikings or were Pictish settlements. Some have white sand beaches, others have golden sand. So tell me, what is so interesting about this town?" Bonnie questioned. The two butterflies were fluttering over the town of Mallaig, on the west coast of Scotland. The harbor was filled with fishing boats, going in and out. There were also a few ferries and even a cruise ship. Bruce looked down, searching for an answer. "Hmmm. You’re right. They’re all much the same, but Mallaig has its unique qualities." "Oh? Like what?" Bonnie asked. "Mallaig was a fishing port. In fact it was one of the busiest herring ports in Europe long ago," Bruce said. "That’s not so unique. We’ve come to many fishing villages. Try again," she dared. "They don’t fish just for fish here. This town is big on prawns and shellfish," Bruce added. "Wow, Bruce. That’s not that special; a few prawns, a few shrimp, clams, mussels….."
He searched for an answer, something that was special about Mallaig. "I’ve got it. There’s a big railway station in town. Trains chug up and down the hills, bringing fishermen, tourists and travelers." "That’s more interesting, but you’ll have to do better than that," Bonnie said, "but first, let’s land somewhere. My wings are very tired." They fluttered down to the top of a building. "Oh look," Bruce said. "There’s the train now. It’s ready to leave soon. Let’s watch it. I love trains." "Whatever," Bonnie sighed. They sat and watched the conductors and passengers as they struggled with their luggage. Just then the train’s whistle blew. It just so happened to be right below Bruce and Bonnie. It was so loud that it knocked the butterflies off their feet. A cloud shot out from the train’s chimney and came billowing towards them, engulfing them in a swirl of smoke and steam. "Whoa! I think I’m deaf now. Cough. Cough," Bonnie said. The steam evaporated into the warm air. "That was rather loud. It’s a call to all last minute passengers that the train will be leaving right away," Bruce explained. They stood up and watched as the train began to chug away. It let out another whistle, but was away from the platform by then. "That was fun. There’s something exciting about a train as it rolls down the tracks." "If you say so. Well, at least its quiet now. I wonder if there are any gardens filled with asters and marigolds?" Bonnie wondered. "I’m sure there are. Let’s go and find some flowers for you," Bruce said. The two flew off in search of some. "What’s that building over there?" Bonnie asked. "I think it’s the lifeboat station. Since this town is right on the coast and since the men go fishing in all types of weather, I imagine they need a lifeboat station here," Bruce replied. "Yes, I imagine they do. Oh goodie, there are some flowers," Bonnie spied. They fluttered down to them. "Aha, marigolds. They’re very pretty." "If you like marigolds. I prefer these pink aster," Bruce said. The two began to sip the nectar. They heard some chirping in the trees behind them. "What kinds of birds are those?" Bonnie asked. She looked around. "They’re just lovely. Look how blue they are." "Bluebirds? This far north? That’s unusual, but those are bluebirds. It looks like someone built a house for them out of wood," Bruce said. "I want to peek inside," Bonnie smiled. "Let’s wait till they leave first. Bluebirds like to eat butterflies," Bruce cautioned. They finished sipping nectar and finally the bluebirds left. "Come on, Bruce, let’s go," Bonnie said, fluttering to the birdhouse. Bruce followed. Bonnie flew up to the small round hole that the birds flew in and out of. "Oh look. It’s a nest, with baby bluebirds in it. How precious," Bonnie said. "Bonnie, if it’s a nest, that means the birds won’t be gone for long. We’d better go. Oops, it’s too late. Here they are now," Bruce said. "Quick. Hide underneath." 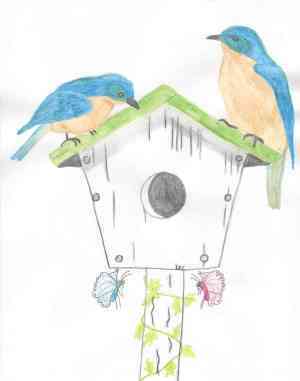 They flew under the birdhouse and hid, just as the two bluebirds came back to the nest. The babies began to chirp noisily. "Come on. They’re both inside. We can escape," Bruce said. A few minutes later they were back at the marigolds and asters. "Whew, that was close. At least I got to see inside a bluebird’s house." "Come on, let’s leave. I hear the beaches are nice around here," Bruce urged. "Party pooper," Bonnie humphed. "All right, let’s go." They flew towards the beach. "Mallaig’s a nice town; small, clean, filled with seagulls, smells like fish down here, but nice," Bonnie added. "Oh Bonnie," Bruce laughed and the two enjoyed the rest of their day watching the waves roll in.